Recent developments in the study of ancient Near Eastern prophecy, as well as new archaeological models of the development of ancient Judah and Israel, have significant implications for biblical prophetic literature. Jason Radine proposes a reassessment of the book of Amos in light of these developments. In comparison with the evidence for prophecy in the ancient Near East (including ancient Israel), biblical prophetic literature stands out as a distinctly different phenomenon. The author proposes that the book of Amos is not a work of "prophecy" as the phenomenon is known from the ancient Near East, but rather a religio-political document explaining and justifying the withdrawal of divine favor from the northern kingdom. 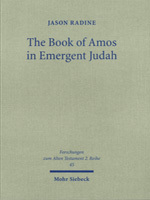 The book of Amos uses lamentation language to describe the Assyrian conquest of Israel, but also makes social justice accusations that justify the northern kingdom’s destruction.